The stylish and practical 24 Inch Monaco Bike has 18 speed gears, allowing you to choose the power that best suits your terrain. The Shimano Rs35 twist grip shifters and Shimano Tz50 derailleur bring the precision of Japanese design to all your gear changes. Use your gears to find the perfect power for the path you choose. Cycle uphill in low gear, ride on everyday terrain in a middle gear and switch to higher gears to ravel further with each push on the pedal as you descend or accelerate. On the 24 Inch Monaco Bike, the left-hand shifter controls the front derailleur for large jumps in gears. The right-hand shifter controls the rear derailleur, allowing you to ﬁne-tune your gear choices. The handlebar grips are ergonomically designed to provide the rider with a comfortable grip. 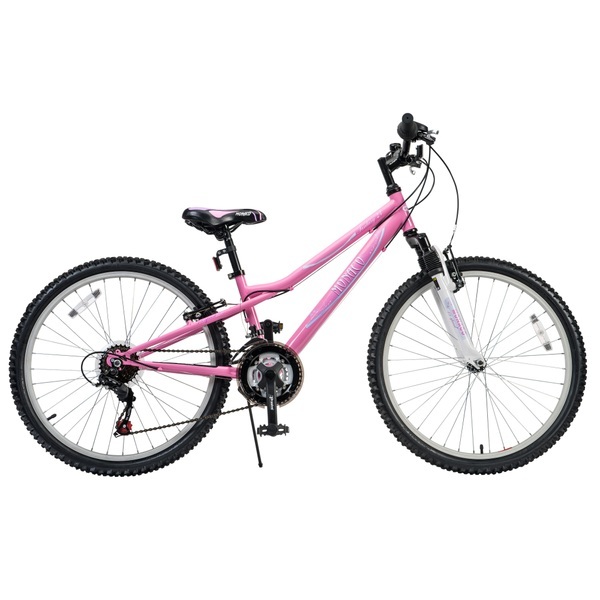 The 24 Inch Monaco Bike features a pink steel frame that’s engineered for strength and durability. The comfortable saddle of this striking bike features a sporty print in pink and white. The alloy V-brakesoperate with a direct-pull mechanism for instant braking action. Zoom front suspension, air pumped tyres and a convenient kickstand complete the design of the strong and pretty 24 Inch Monaco Bike. EU Warning: Not suitable for children under the age of 3 years due to small parts which could cause a choking hazard. Protective equipment should be worn (knee, wrist, elbow pads and helmet) Adult supervision recommended.